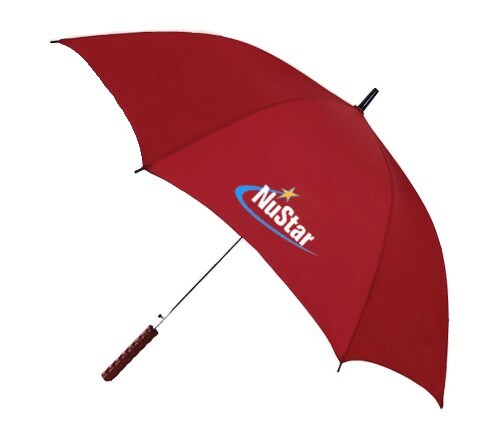 Personalized 48 inch arc auto open straight umbrellas is suddenly becoming a hot gifting choice for marketers due to its durability, purpose and affordable price range. These trendy umbrellas are becoming a common sight in crowded city centers and outdoors, where people are trying to seek defense against winds and heavy downpour. Being offered in plethora of solid and alternated color panels, you can easily find the one, which matches your interest. Request a quote to know what you may save on bulk ordering these customized 48 inch arc auto open straight umbrellas. Features – Plastic tips and ferrule caps for safety. One button automatic open. Wooden handle with comfort grip. Metal shaft and armature. Eight (8)-panel umbrella. 48inch arc. Customer Service & Shipping - Emily the woman on the phone was phenomenal. Very knowledgeable and professional. Product & Design Quality - Looks great and I know there are machines to do this but getting 2 logos on an umbrella is very impressive! Customer Service & Shipping - Richard Weaver, Senior Account Manager, was very helpful and courteous. Product & Design Quality - Product is excellent - much higher quality than I expected! Customer Service & Shipping - Customer service is spot on and very responsive. Easy transaction, great prices and quick delivery. Product & Design Quality - We are very pleased with the look and feel of the umbrella. Time will tell how it performs and lasts, but our first impressions are good. Customer Service & Shipping - Very happy with customer service and speedy shipping. Product & Design Quality - VERY PLEASED WITH THE QUALITY! Customer Service & Shipping - CUSTOMER SERVICE WAS EXCELLENT - VERY HELPFUL FOR FIRST TIME CUSTOMERS AND THE PRODUCT WAS SHIPPED WITHIN DAYS OF ORDERING!! Product & Design Quality - Product and Design was great! Very impressed by the quality. We had multiple companies send us samples to try and this by far was the best built and nicest umbrella we found. My adviice to anyone looking...don't waste your time with another company and just order from here. No issues with the imprinting either as it looked great. Customer Service & Shipping - Shipping was as expected and the Customer Service received was top notch. There is nothing better then dealing with a company where people are pleasant and responsive. Product & Design Quality - Product is reflected well on website and arrived looking even better than I thought they would! Customer Service & Shipping - They worked one-on-one with me to make sure our logo printed well on the umbrellas. Great customer service. Product arrived on time too. Product & Design Quality - Great design, great quality, everyone LOVED this as a holiday gift. Customer Service & Shipping - Customer service was fast to respond to my questions. And shipping was very fast too. Product & Design Quality - Great! Just what we ordered. Customer Service & Shipping - Awesome! Customer service was friendly and knowledgable and the production/shipping time was quick.